Western White Pine/Idaho White Pine (Pinus monticola) We prefer to call this species Idaho White Pine, for obvious reasons. :) This is a beautiful tree with an interesting history. Prior to European settlement of this area, it was the most abundant tree in our forests, but its numbers have shrunk to less than 7% of its volume just 40 years ago. The main culprit is a blister rust that was accidentally imported in 1910 on French white pine ornamental shrubs. Efforts have been and are being made to help the species generate a natural resistance to the disease, but forests are not altered greatly in a few short years. Likely there will not be a significant comeback of the species in our lifetime, and probably there will never be the volumes that used to live in the Idaho forests. 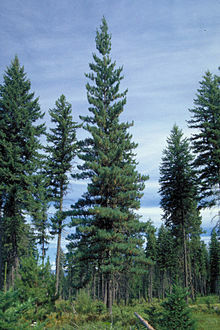 Today in the Idaho panhandle White Pine are harvested mainly when mixed species forest are harvested from State, private and Federal lands. There are just a handful of mills left who run exclusive White Pine runs. Here in our small town of Bonners Ferry, our Idaho Department of Lands office has a stand of these beautiful trees planted in front, as part of that re-forestation effort. I have enjoyed watching those trees grow for well over 20 years. White pine is a soft, straight fibered wood with a milk-white color and red/brown knots. The logs are beautifully straight and round, the bark thin and smooth, and they are a joy to saw. The knotty grades make some of the best paneling that can be found in the Pacific northwest.